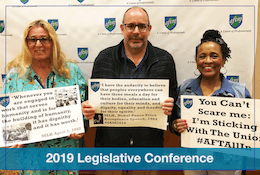 AFTNJ’s objective is to promote state wide organization and unionization of public and private school teachers, paraprofessionals and other school-related personnel; higher education faculty and staff; other workers organized in conformity with this constitution; and other employees who may be members of any AFT New Jersey State Federation affiliate whose constitution so permits. Organizing is the best way to obtain and protect your rights at work and as citizens. We aim to raise the standards of members’ professions by securing conditions essential to the best professional service. Have voice in the establishment and implementation of professional standards. Be vigilant and proactive on social justice issues impacting the quality of and access to education (PreK-postsecondary) throughout the State of New Jersey. Defend members against intimidation, interference, or discrimination based upon race/ethnicity, gender, age, sexual orientation, disability, national origin, and/or religion. 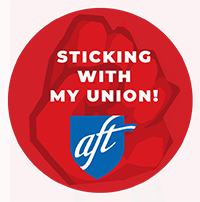 We can work with you to organize all educational staff into AFT New Jersey State Federation, in private, public and charter schools; higher education and other fields. Contact AFTNJ to discuss organizing your workplace.